Shiver me timbers! It seems as though the burgeoning mobile gaming market is going to be as clogged with pirate-themed slots as the online gaming one already is. 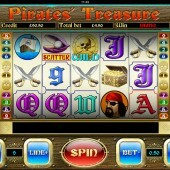 And the latest sea dogs to hoist the Skull ‘n’ Crossbones and set sail to raid some Spanish booty is mFortune, a dedicated mobile casino firms responsible to no-nonsense action on your tablet or smartphone. 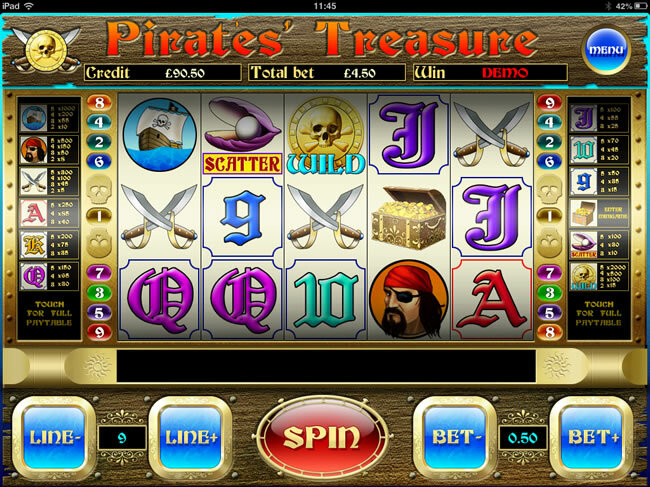 Pirates Treasure is – as with most of mFortune’s current portfolio – is a 5 reel, 9 payline mobile slot that’s perfectly suited to your phone’s screen. Betting ranges from $0.01 to $1.00 a coin and there are 9 paylines but no more. It makes sense to get used to the interface before you play. The game screen doesn’t take up too much of the screen, with most of the space occupied by the Spin, Lines, Bet and Paytable buttons. Having said that, because the game is downloaded as an app straight from the casino there’s no issue with connectivity. Pirates Treasure also shares some of mFortune’s other traits in that it’s pretty limited on its range of icons. Aside from the bearded Pirate, Cutlasses and Pirate Ship icons there are really only the 9-through-Ace symbols to keep them company. Look out for the Gold Coin symbol which acts as the game’s Wild. It substitutes for all regular symbols in the game other than the Scatters. The Pearl, meanwhile, is the Scatter and anywhere from 5-9 free spins can be won by hitting 3, 4 or 5 Scatters on the reels. Three or more Gold Chest icons on the reels triggers the game’s second bonus round, a fairly straightforward Pick ‘em Bonus game. While not carrying the progressive jackpot of mFortune’s comedy-themed Cat & Mouse slot, this still offers plenty of bonuses you’ll find in a typical mFortune mobile slot. The game – like all of mFortune’s slots – hails from the firm’s homegrown mobile casino and is therefore available to download straight to your phone. As it works as a standalone app, it works well wherever you are and is pretty slick on an Apple or Android device. For some more decent mFortune games on your tablet, check out the aforementioned Cat & Mouse with its progressive jackpot or the cracking caveman-themed Winstones slot – both are a good showcase for what mFortune is all about.